Periodically, it is important to assess whether or not the shaker in your lab is performing properly. Poor shaker performance – caused perhaps by a crack in the armature or flexure fatigue – will negatively affect any product test results performed on the shaker. Consequently, routine shaker validation tests should be performed on laboratory shakers to ensure that they are performing according to their shaker standards and specifications. There are a number of methods to ensure that a particular shaker is performing properly. In the following paper we describe a sine test methodology that we recommend. We base this recommendation on the basis that many shaker manufacturers rate their shakers according to a sinusoidal vibration peak force test (Figure 1). In addition, a sinusoidal test will sweep through a range of frequencies using tracking filters – accurately informing the test engineer of vibrations across the frequency range of the shaker capabilities. Figure 1: Sinusoidal vibration peak vibration data for the VR5200 shaker. Every laboratory test facility will need to tweak the following recommended methodology according to their own unique needs and circumstances, such as frequency range, G level, and frequency of shaker validation tests. To illustrate our recommended methodology for shaker validation tests, we simulated a test on our Unholtz Dickie shaker in the Vibration Research lab. We kept the expander head mounted to the shaker so that we could more easily simulate a “damaged” or “faulty” shaker situation. Three accelerometers were mounted on the head expander of our shaker. One accelerometer was mounted towards the center of the head expander, while the others were mounted towards the corner (we mounted two accelerometers in the corner to ensure that the data from the corner was consistent). In some tests a “loose” wrench was laid on the head expander to simulate loose bolts or some other shaker anomaly (Figure 2). Figure 2: Head Expander with accelerometers mounted at the center and the corner. 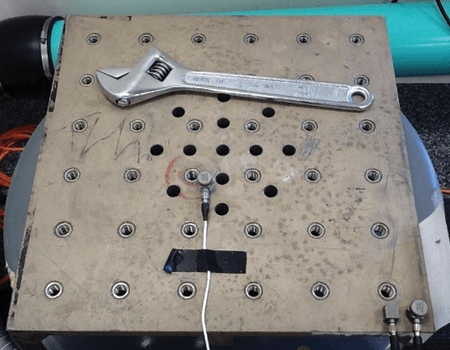 An unmounted (loose) wrench was placed on the head expander for some tests to simulate shaker anomalies. Our recommended method of validating that a shaker system is working consistently and properly is to conduct a sine sweep. In this case, we ran a sine sweep test (1 G) across the frequency range of 20 Hz to 1500 Hz. This sine sweep test was conducted for two scenarios. First, we ran the sine sweep on the shaker/head expander with all the bolts firmly tightened. In the second case, we repeated the sine sweep with an unmounted wrench on the head expander (Figure 2) to simulate some damage situation of our shaker. Then the data files for the two tests (tight vs. loose) from the center accelerometer were compared in terms of total harmonic distortion (THD) (Figure 3). Total Harmonic Distortion (THD) compares the accelerations at a specific frequency to the accelerations of the next ten harmonics of that specific frequency. In the ideal world a pure sine tone is perfectly smooth and has no distortion. In the real world, however, there can be a number of things that affect the quality of the sine tone so that it has some distortion to it. That distortion is due to harmonic content that may be in the signal. For example, if you have a 60 Hz sine tone, the harmonics of 60 Hz would be whole number multiples of the fundamental (60 Hz), such as, 120 Hz (60 X 2), 180 Hz (60 X 3), 240 Hz (60 X 4), etc. If you have energy in these harmonics then that will be reflected in a distorted sine wave signal. 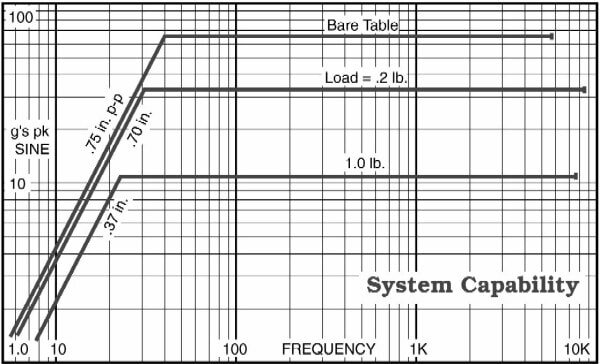 The Total Harmonic Distortion is a measure of how much harmonic content there is in a signal. A large THD value would indicate that there is significant harmonic content in the sine signal. The physical reality of a high THD is that there is some weakness or malfunction of your shaker system. Therefore, THD is a valuable tool to measure how accurately a vibration system is reproducing the output signal from a controller, and can help track system changes over time. Small THD values indicate that the system is performing as the controller is calling it to perform, whereas large THD values are indicative of a problem with the system. When we compare the THD (green) of the head expander with all bolts firmly tightened to the THD (red) of the same setup but with a loose wrench lying on the head expander, it is very clear that the loose wrench scenario produces a much different response than the scenario without the wrench (Figure 3). Although the data collected in the sine sweep test could be analyzed in many different ways, we recommend the use of the Total Harmonic Distortion plot to evaluate the shaker performance. We do this, in part, due to the clear visual clues that are provided in the THD plot – clearing demonstrating if something is awry with the shaker system. From running a sine sweep and analyzing the data from the perspective of the THD, a test engineer can evaluate the shaker’s performance. When the shaker first arrives at the laboratory testing facility, the THD of the shaker can be established. That value should be low – certainly less than 10%, across the frequency spectrum. In the case of our laboratory’s Unholtz Dickie shaker, the THD is less than 1% across the frequency spectrum (Figure 3). When a laboratory testing facility establishes the baseline THD for a shaker, then each monthly or quarterly shaker validation test should produce a similar THD response. If something is not right with the shaker, then the THD response will vary from the baseline value. 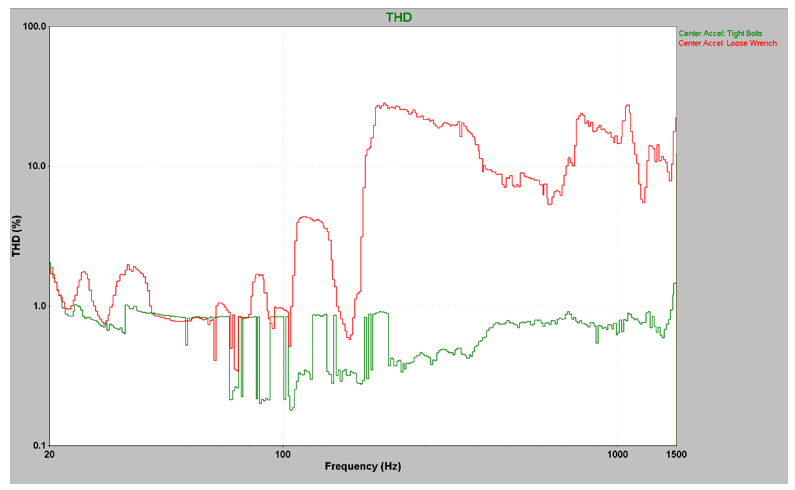 In our simulated shaker validation test, the loose wrench vibrated so much on the head expander that the THD deviated greatly from the baseline THD and greatly exceeded the 10% value for much of the frequency spectrum (Figure 3). The loose wrench scenario is obviously an extreme situation, but it illustrates well the value of comparing THD values. Figure 3: Total Harmonic Distortion (%THD vs Frequency). Our “healthy” shaker has a %THD less than 1 across the spectrum. Across the spectrum the %THD is significantly different when the wrench rattled on the shaker. Test engineers would do well to regularly check the validity and reliability of their shaker system. A simple way to perform a shaker validation test is to run a sine sweep across the frequency spectrum of the shaker and evaluate the THD of the system. Once a base-line THD is established, future THD responses can be compared to the original base-line value. This method certainly has its advantages. First it accurately covers an entire range of frequencies, not just an isolated, single frequency as done in system check. Secondly, shaker performance standards are produced using sine sweeps, so evaluating shaker performance in the lab should be accomplished with the same kind of a test. Finally, a sine test evaluated with the Total Harmonic Distortion plot is a very easy and simple way to determine if the system is operating as it should.